Hello Friends, it's Erin from The Elementary Darling. The countdown is on! I have about four weeks left before the end of the year, and this is the time that I start planning for the summer and organizing for the beginning of the year. I know some of you are thinking, "She is crazy!" and I might be a little bit, BUT the end of the year is the best time to organize and plan. Last year, I wrote this post about what I do a the end of the year, and Kristin wrote this post, about planning during the end of the year. But TODAY, I am going to show you my favorite professional development books. Obviously, I would recommend checking out one or two based on your needs, however they are ALL amazing! I love anything written by Ron Clark, but Move your Bus is my favorite. I reread it often to remind myself to be a runner! If you don't know, his co-owner of The Ron Clark Academy is Kim Bearden, and her book, Crash Course will remind you why you went into teaching. It is my ultimate favorite! I also recently found the book Conscious Discipline, thanks to my friend, Theresa from True Life I'm a Teacher. This book is all about teacher mindset. I just started it, and I am loving it! Throughout this post, you’ll find Amazon Affiliate links. This means I receive a small commission if you purchase something through that link, at no extra cost to you, that helps keep my blog running and helps fund giveaways! These books are good for reading groups, or ideas for your groups. Even if you have been implementing reading groups for several years, I know you will find something useful in them! These two books are my everything when it comes to Guided Reading. Jan Richardson has everything you need, including strategies and printables in this book for every level of guided reading. The Daily Five book is great for anyone who uses a grouping method for reading. I also LOVE Word Nerds. This book has amazing ideas for vocabulary instruction. While I would recommend it for 2nd grade and above, it could be modified for Kindergarten and 1st grade. I LOVE this book! Debbie Diller is an amazing math group guru, and she has fabulous ideas in this book! It is for grades K-2, so if you have a book suggestion for 3-6, I would love to hear it! If you are a GenEd teacher and you have a huge range of student abilities in your classroom, these are my top picks! I got my gifted endorsement several years ago and the book, Teaching Gifted Kids in Today's Classroom is my all time favorite. It has so many suggestions to extend the learning of higher level students. Advancing Differentiation and How to Differentiate Instruction for Mixed Ability Classrooms are both amazing and so helpful when your classroom ranges in ability levels. How many times have we all run out of ideas or needed new fresh strategies for teaching a topic? I recently found these books this year, and I never knew what I was missing. THEY ARE SO GOOD! You can use these books no matter what ELA format you use. It is literally a book full of strategies for every level. They do cost a little more, but honestly, they are worth EVERY penny. You can find the reading one here and the writing one here. These two will be the ones that I will be reading over the summer! 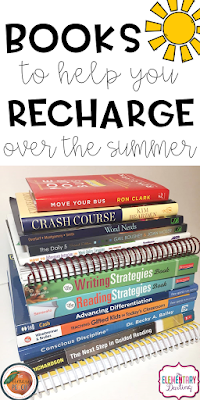 What professional development books will you dive into this summer? 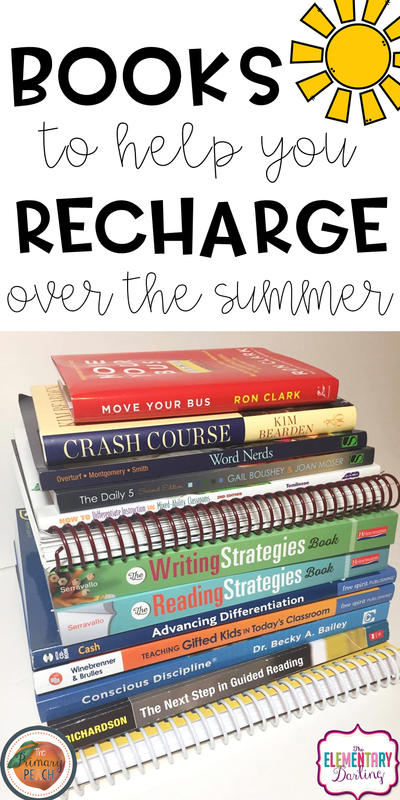 Whether you are reading to recharge, learn new strategies, or try a new method, these books will help you achieve your goal! Do you have an awesome book that I didn't show, leave it in the comments below! Happy Reading! The video streaming applications have been very famous lately, as the usage of the smartphones has increased exponentially over the last couple of years. And when we are talking about the video streaming applications, we can’t ignore SnapTube as it is the most popular streaming application of the recent time and offers various innovative features to the users. Online casino games are popular. Like to arrange a notebook. As summer has approached; I am always in search of a great book to read while I am relaxing on the beach or by the pool. I believe that reading is the backbone of our society and we need to get back to our roots. Great article that you have shared about the inspirational Books. Books are the best friends for everyone. your article is useful for those students who are looking for the best books to get more knowledge. If you are looking for the best LMS software in USA, Schoolthinks is the best choice.